Above we can see an article published in 2016 about Peripheral Blood Stem Cells [another name for Very Small Embryonic-Like Stem Cells (V-cells)]. These cells continue to gain recognition in scientific circles. We have suspected for some time now that these cells seem to correct many health problems behind the scenes. They can be considered an emergency stem cell supply in the body. They are typically quiescent but come activated under stressful conditions that the body may encounter. Clinically, many studies show that subjecting these cells to four degrees centigrade, hypoxia, or both will cause activation of these cells. Anecdotally, we have seen a number of interesting clinical effects from these cells. For example, they seem to deal very well with a range of auto-immune diseases. In the case of osteoporosis, we have seen a significant increase in bone density following treatment. [In many circles osteoporosis is considered an auto-immune disease]. 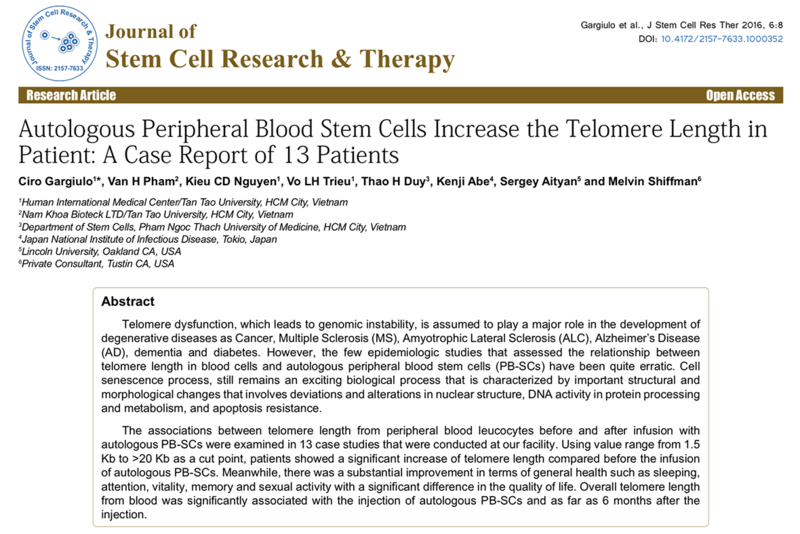 An even more exciting finding that the above scientific article conveys is that there is a positive change in telomere length in patients after treatment with these cells. This can have profound implications in the antiaging world. 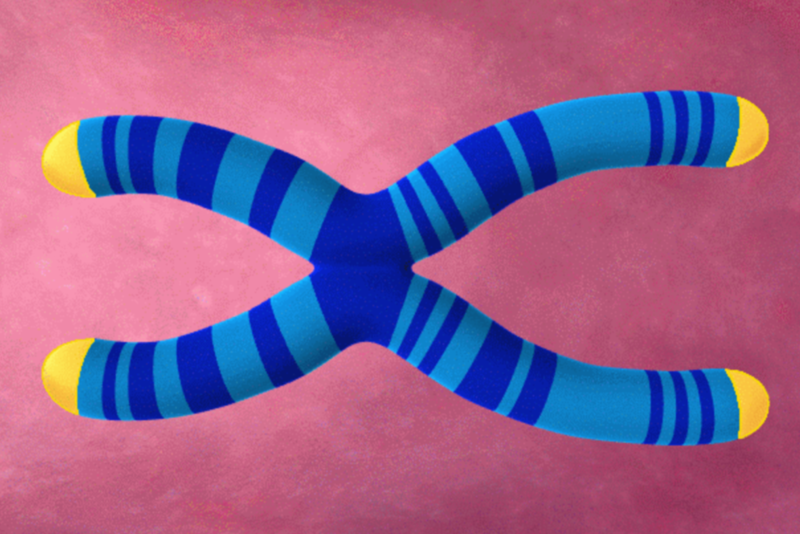 Let us take a better look at Telomeres and their ramifications. I have been intrigued with Telomere science for many years. In my practice, I strive for methods which will at least slow down telomere degradation in various regenerative cells. We know that certain supplements can achieve this goal and some may even reverse telomere damage a bit. 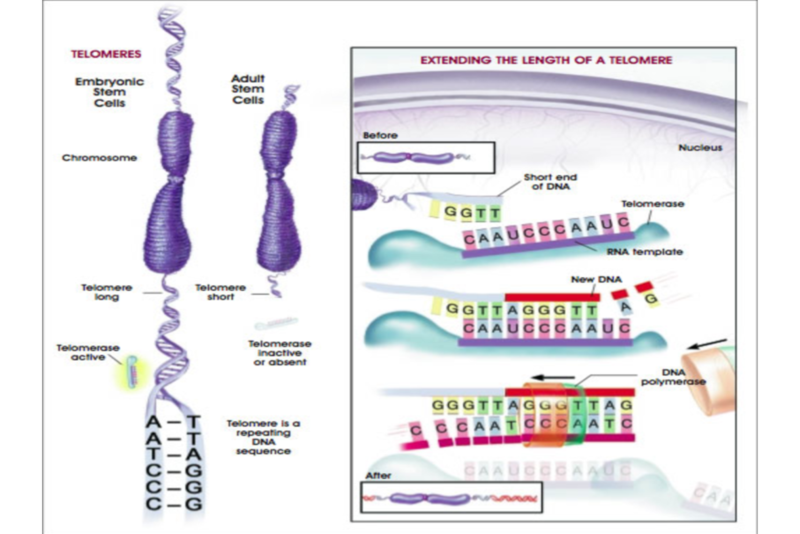 The following is a diagram on telomeres which are the end caps of DNA. The yellow represents the Telomere. Every time our cells divide they lose a snippet of DNA which is the telomere. With each division of the cells the telomere becomes shorter and shorter. When the telomere reaches a certain critical length the cell typically dies. Unfortunately, telomere degradation is a relentless process. Your telomeres were in better condition this morning than when you will go to bed tonight. This is one of the reasons why it is recommended to save babies' cord blood. The telomeres in the cord blood stem cells will never be as good as they were on the day the baby is born. Furthermore, it is even recommended that adults may want to consider storing their stem cells in a bank to have a supply of cells with a reasonable telomere length. In some ways, this is like an insurance plan. Someday those same cells may be used to correct a disease process that has developed. They may be used to save your life. Typically, these cells would need to be increased in numbers by culturing them. After the culturing process, they could potentially be utilized in disease treatment. This procedure would need to be done outside the US according to current regulations. Short telomeres are associated with many different diseases ranging from cancer, osteoarthritis, diabetes, and many neurological conditions. Some of these neurological conditions may include Alzheimer’s Disease which is one of the scourges of modern society. The following diagram shows the difference in size between an embryonic cell and adult cell as far as the DNA and its telomere is concerned. Embryonic cells have much higher regenerative capacity. The fact that the embryonic cells have longer telomeres contributes to their high regenerative capacity. However, embryonic cells have many pitfalls which limits their regenerative potential. Furthermore, there are ethical issues associated with them. Below is another fascinating diagram. This diagram was in reference to an article written in Popular Science magazine about a friend of mine Dr. Bill Andrews. Dr. Andrews has a quest of finding substances which will stimulate telomerase production. He is considered one of the world’s experts in the field of telomerase activation. I suggest that you go to his website www.sierrasci.com and read more about his work. The above slide is actually the work of Dr. Ron DiPinho of Harvard. Dr. DiPinho proposed that short telomeres ultimately affect the mitochondria causing them to lose effectiveness and cause the "death spiral of the cell". 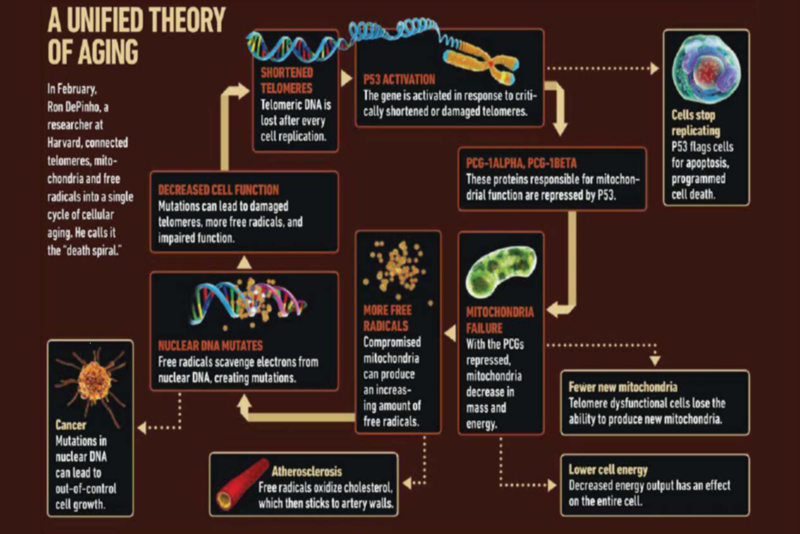 What we are seeing is that the production of an enzyme called P-53 seems to have a detrimental effect on mitochondria. The P-53 enzyme suppresses certain critical proteins that are responsible for proper mitochondrial function. If the cell is allowed to die, there is no problem. If the cell continues to survive, then the mitochondria produce free radicals which wreak havoc on the body on many different levels. The cell is programed so that, when its telomeres reach a certain critical level, the P-53 gene becomes active and it leads to cell death. This is a double-edged sword. In a perfect world, the P-53 gene will cause the cell death on an aging cell. It is a very good protection for the body. In many research circles, P-53 is called the tumor suppressor gene. We can see from the above diagram that, if the P-53 gene does not eliminate the aged cell, many bad things begin to happen. There is a great deal of research concerning methods on how to turn on the P-53 gene. Another method of helping the P-53 gene is to use senolytic agents in the body. Senolytic agents are compounds which essentially kill senescent cells. The senescent cells are cells that should have died but instead remain alive and secrete many inflammatory growth factors. These "bad" growth factors are responsible for many different medical problems. Senolytic agents may be a good helper to the P-53 gene. Too much P-53 is just as bad as too little. Overstimulation of P-53 may adversely affect our stem cells and cause their untimely death. The best thing that could happen is too slow down cell aging so that we do not get free radical formation. One very good way to slow down cell aging is to actually reverse it. 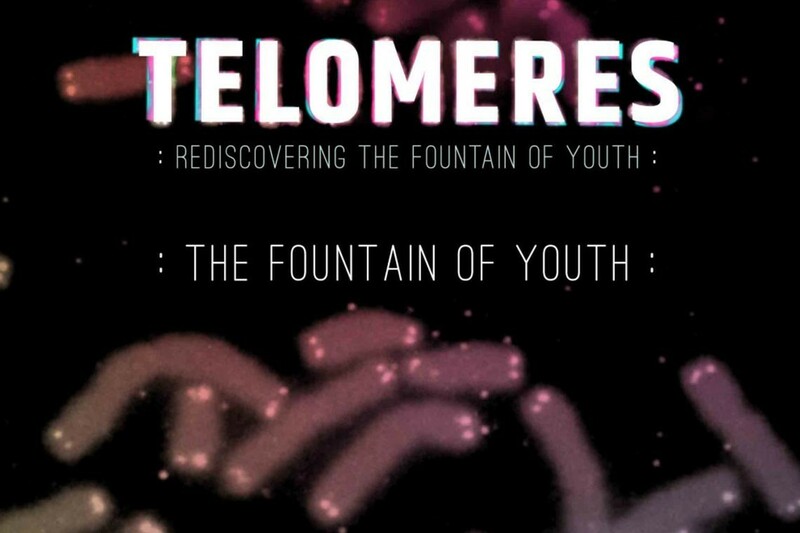 When we extend the length of the telomere we are reversing aging. What we are finding is that if we are able to preserve or lengthen the telomere length there may not be a need for the P-53 tumor suppressor gene. We will not have cells that have critically short telomeres. Getting back to the original article, the cells that were studied in regards in telomere length were the leukocytes. Leucocytes are white blood cells. They represent a very important aspect of our immune system and actually have a profound influence on stem cells and their function. Stem cells and their efficiency are intimately tied to our immune system. Most studies that look at telomeres typically assess the cells of the immune system. The younger our immune system, typically the healthier we are. Failures of our immune system lead to numerous diseases. In the paper, here is a quote from the authors “We can only speculate that the phenomenon of increased telomeres may have been due to activation of telomerase through series of signaling pathways triggered by stem cells itself". It appears that V cells produce telomerase. In some circles, this is one of the Holy Grails of anti-aging. The cells seem to turn on telomerase in other cells enabling these cells to go back in age. At least, this appears to be happening in the immune cells. The significance of these peripheral blood stem cells cannot be over emphasized. When there is a process or cell type that will increase telomere length of immune cells we all have to sit up and take notice. These V cells may help correct many medical conditions and probably make our stem cells healthier and more efficient by increasing their telomere length. One observation we have seen is that when we combine a V-Cell procedure with a regular procedure [to treat a specific problem] utilizing let us say bone marrow aspirate our results are better. I am not sure of the reason for this but improving the telomeres of the stem cells may be one explanation. The relationship between the length of telomere and aging is a very complex process. Regenerative capacity adopted by the body’s constant use of stem cells is strictly interdependent with endogenous and environmental exposures and other sources of oxidative stress that eventually induce internal epigenetic changes in the cells. Are these cells going to stop aging? The answer is of course not. But they may help slow it down. Time will tell with no pun intended.